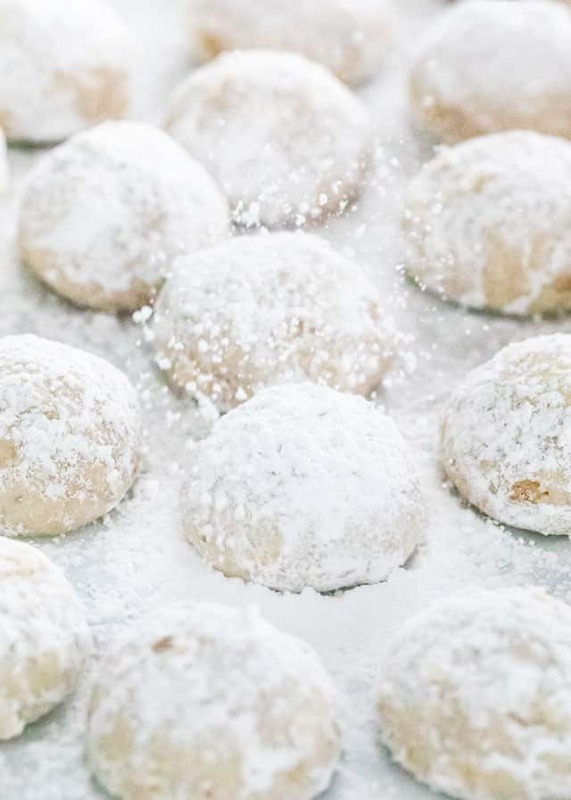 These Mexican Wedding Cookies are soft, buttery pecan cookies that melt-in-your-mouth! Don’t get fooled by the name, these cookies will make a great addition to your favorite holiday cookies. They’ll be gone in seconds! These cookies go by many different names. 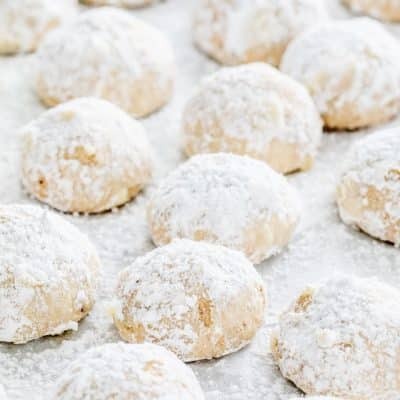 I’ve always known them as Mexican Wedding Cookies or snowballs. Honestly, I have no idea where they originally come from. But it doesn’t matter because they are delicious and the perfect Christmas cookie. If you are a fan of pecans, you will love these cookies. They melt in your mouth. Ground pecans, butter, powdered sugar, yum! Together it’s the perfect marriage, they work together very well and creates magic in your mouth. They really are one of my favorite cookies during the holidays and not a Christmas goes by where I don’t make them! They are very easy to make. Start by placing the pecans and powdered sugar in a food processor. Now pulse the pecans and powdered sugar, until the nuts are finely ground, for about 2 minutes. Add the pecan mixture, the butter and vanilla to another bowl and mix. You can mix it until everything is well combined. In another bowl mix the flour and salt together. Slowly add the flour mixture to the mixer bowl and mix on low speed until everything is well incorporated. The fun part is when you scoop up tablespoonfuls of the dough and roll the dough between the palms of your hands into a ball. Place the balls on a cookie sheet lined with parchment paper, or a silpat, 1 inch apart. Bake the cookies in a preheated oven at 325 F degrees for about 18 to 20 minutes and then transfer them to a wire rack and let them cool completely. 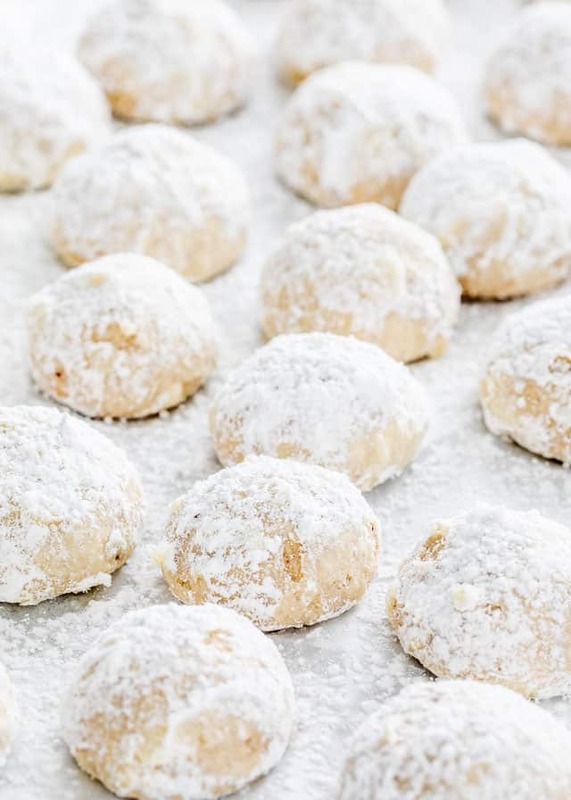 In a bowl sift about a cup of powdered sugar then roll each cooled cookie in the sugar to coat it completely. You can store them in an air tight container at room temperature for about 3 days, if they’ll last that long. If you notice that the powdered sugar on them melts into the cookie, don’t worry. Just sprinkle them with more, or simply roll them through a bit more powdered sugar. Nobody will notice or mind! 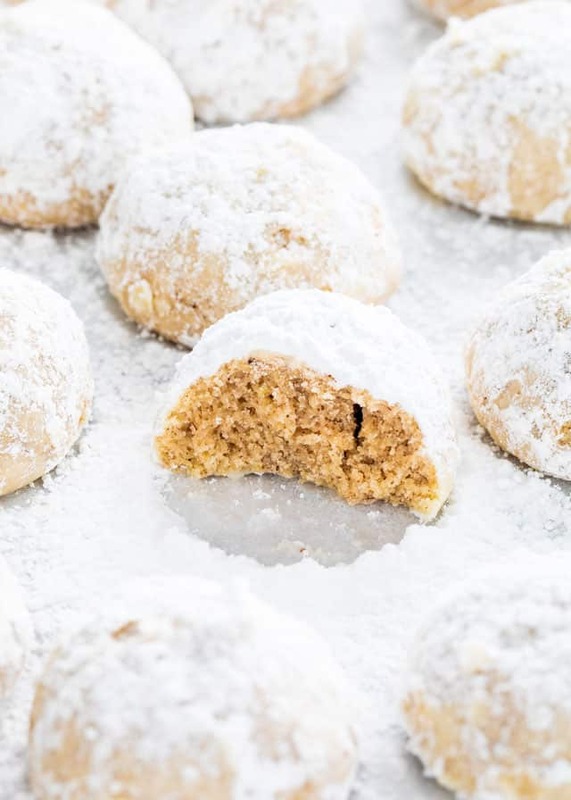 Mexican Wedding Cookies – don’t get fooled by the name, these cookies will make a great addition to your favorite holiday cookies. Preheat oven to 325 F degrees. Line a cookie sheet with parchment paper or silpat. Place the pecans and powdered sugar in a food processor. Pulse the pecans and powdered sugar, until the nuts are finely ground, about 2 minutes. In the bowl of your mixer, add the pecan mixture, the butter and vanilla. Mix it until everything is well combined. Scoop up tablespoonfuls of the dough and roll the dough between the palms of your hands into a ball. Place the balls on the prepared cookie sheet. Bake the cookies for about 18 to 20 minutes and then transfer them to a wire rack and let them cool completely. Store them in an air tight container at room temperature for about 3 days. this is very similar to my grandmother’s tried and true recipe and it wouldn’t feel like christmas without these cookies. my recipe uses granulated sugar in the dough instead of powdered. 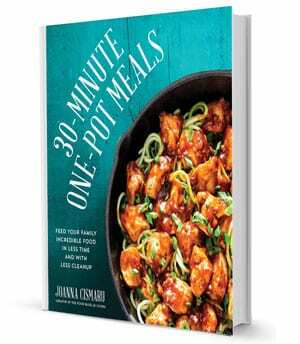 i am going to try your recipe this year. although the original recipe calls for pecans, i have often subbed almonds and they are delicious that way. I noticed another commenter indicated that she rolls the cookies in the powdered sugar twice – once right out of the oven and once after they have cooled. my recipe calls for that step as well. thank you for sharing this. it’s truly a holiday must-have! I loved your Russian Tea Balls recipe a lot better then mine. I writing a recipe book of all my favorites for my daughters. I have included this recipe and some of other ones l have made that they loved also. 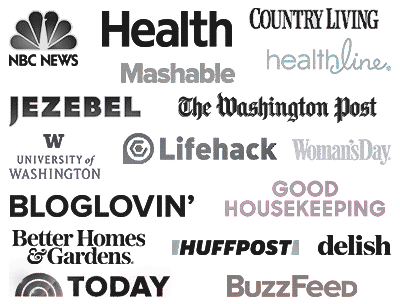 Merry Christmas and a healthy New Year Thank You! Wow congrats on writing a book! Merry Christmas to you too! Do these freeze well? I made them 2 days ago and they are delicious. Thank you for the great recipe! Yes they do! In fact, we have a batch in the freezer right now. I usually end up rolling them twice in icing sugar too. I have a great chocolate rumball recipe. Yes, the writing in blue is actually a link and if you click on it, it will take you to the recipe, or just click here. I would be interested in the Rum Ball recipe if you can share. Yeah, I believe you can. I would consult the huge manual though 🙂 I haven’t gotten around to making dough in mine yet, but I know it’s possible. We were just invited to a Mexican dinner. So while looking up Mexican desserts I found your recipe. I am looking forward to tasting them when they come out of the oven. I already know that the raw batter was great. Thanks. Great recipe. Just made them tonight and they turned out great. I’m pinning to my Food & Booze board now. Glad you liked them Summer. My mom used to make these for Christmas when I was a kid! Thanks for the reminder! I can’t wait to try them again. These are very similar with the Greek Kourabiedes. I like to add a little ground cloves, gives them a very nice flavor. Have a very merry Christmas! I just made these cookies this weekend, with almond flour. They’re melt-in-your-mouth good and so delicate. I’ll be making more this Christmas season. They do melt in your mouth. They are soo good! I love your picture! These look delish!